Bijbelstudies - 6023: Is the True God a Trinity? - Each one is God, and yet together they are only one God. Other dogmatic explanations emphasize that these three "persons" are not separate and distinct individuals, but three forms in which the divine Essence exists. Incidentally, the Trinity is certainly not a trouvaille of Christendom. On the contrary, since the founding of the apostate city of Babel the doctrine of a triune God has flourished within Paganism. As is the case with the doctrines of an immortal soul and a burning hell, the same applies for the teaching of the Trinity, they are all taken from the archetypes of Heathenism. Triads go very far back in pagan demon worship. 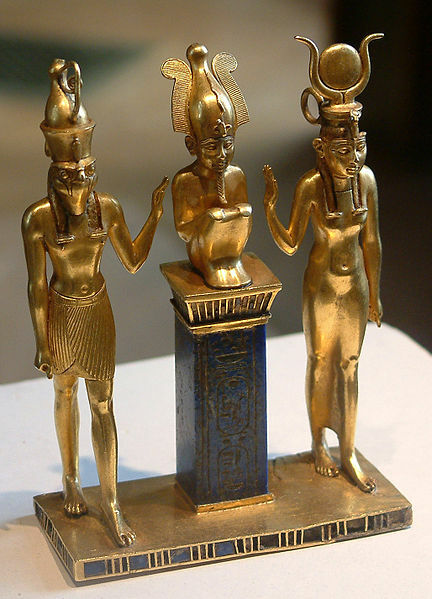 The Egyptians already had the triad of Osiris, Isis and Horus. Pay attention to yourselves and to all the flock among which the holy spirit appointed you as overseers to shepherd God’s congregation, which he purchaseded with the blood of his own [Son]. I know that after my going away oppressive wolves will enter in among you, not sparing the flock; even men will rise from your own circle and speak twisted things to draw the disciples after them. For such men are false apostles, deceitful workers, transforming themselves into apostles of [the] Messiah. And no wonder, for Satan himself masquerades as an angel of light. So it is no great thing if his servants masquerade as servants of righteousness. Whose end shall be according to their works. • Man has an immortal soul. • At death that ‘soul’ goes to a shadowy afterlife, or to a fiery, burning hell. • The only true God [John 17:3] would in fact be a triad of three gods: Father, son and holy spirit. What a difference, therefore, between the apostle of the Gentiles, and the Pagan oriented clergy of apostate Christendom which also formed ponderous religious institutions in which no movement to improvement can be obtained, nor in their dogmatical doctrines. And this is life eternal, that they might know you, the only true God, and him whom you sent, Yeshua, [the] Messiah. Yeshua is YHWH Elohim's Son, not the one true God himself. Like Moses wrote in Psalm 90, that One true God is from eternity to eternity. He is the image of the invisible God, the firstborn of all creation, because in him all things were created in heaven and on earth, visible and invisible things; whether thrones or dominions, or principalities, or powers: all things were created through him and for him. And he himself is before all things and all things exist together in him. The relative pronoun ος [who] connects him who is the image of the invisible God, with the Son of his love (verse 13), in whom we have redemption, the forgiveness of sins (verse 14). For Paul, that statement is the starting point for painting the high position that the Son is occupying within creation. To appreciate his argument, it is fundamental that we establish in the first place that the Son himself also belongs to creation, which can be concluded from the fact that he is described as the firstborn of all creation. How we view πρωτοτοκος, either as first of all created beings, whether his primacy in dignity and eminence above all other created things, the fact remains that he is part of YHWH Elohim's creation. Compare: Ex 4:22 and Ps 89:27. Compare also Revelation 3:14, where the glorified Yeshua himself - walking in the midst of the seven candlesticks (the sevenfold Jewish End-time community) – declares: These are the things that the Amen is saying, the faithful and true witness, the beginning of the creation by God. However, as Elohim's first creation, he is at the same time also his principal creation, even to the extent that he was made after the image of God, or as the apostle wrote elsewhere: existing in Elohim's form (Fp 2:6), referring to his pre-existence. In Colossians 1 however, the apostle also revealed something very special about him: In him all things were created in heaven and on earth… all things were created through him and for him. In him indicates that all creation is inextricably linked with his person. Without him nothing at all would be created. All things are existing together in him. The Son of God's love is not only the one through whom Elohim really brought forth all the rest of creation, but the continued existence of that creation is entirely dependent on him too. In direct connection with this, the Son therefore is the ultimate goal of creation, for all things are not only through him [δι αυτου], but also for him[εις αυτον] created. How could these things happen? Of course, YHWH Elohim knows himself perfectly; his essence is nothing strange to him, unlike us, humans. With some scare we may sometimes observe what kind of things seem to live deep within us; but not so with God, he fathoms himself completely (1 Cor 2:10-11). 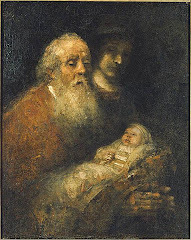 Consequently, he was able to ‘produce’ his firstborn Son in such a way that in him his own being became fully visible, reflected as it were; a true image as it were. Accordingly, in that pre-existent Son, the Father saw the created things in rudimentary element present. This explains why God at the end of the Sixth day of creation [or period] could say, Let us make man in our image, according to our likeness (Gen 1:26). Elohim himself, personally, could have proceeded to that action, but that did not belong to his purpose. Through the agency of his Son the creation would come into existence, because in him all things had to be brought forth. “Yahweh acquired me [as the] beginning his way, before his works of old. From everlasting, I was set up, from beginning, from aforetime [the] earth. When [there were] no deeps, I was brought forth; when there were no fountains abounding with water. Before the mountains were settled, before the hills was I brought forth… Then I became master-workman by his side. I was a delight day by day, always rejoicing before him, rejoicing in the productive land of his earth; and the things I was fond of were with the sons of men”. So, in his pre-existence the Son existed in Elohim's form, being from everlasting, from the beginning, as is confirmed for us in the well known announcement of Micah 5:2 >> But you, Bethlehem Ephrathah, being small among the clans of Judah, out of you one will come forth to me that is to be ruler in Israel; whose goings forth are from of old, from everlasting. In that godly form he was not the second person within a supposed trinity, equal to Elohim, his Father. Of course not! How could the apostle else have written that he, the son, in that capacity, did not consider a robbery to be equal with Elohim! No! He did quite the opposite, as the apostle goes on further: He emptied himself and took a slave’s form and came to be in the likeness of man! In the sixth month [of the pregnancy of her cousin Elizabeth who would give birth to John, Yeshua's predecessor who would introduce him to Israel] the angel Gabriel was sent forth from God to a city of Galilee, named Nazareth, to a virgin who was promised in marriage to a man named Joseph, of the house of David; and the virgin's name: Mariam. And after entering before her, he said: Rejoice, highly favored one, the Lord is with you. However, she was deeply disturbed about the word and she wondered what a greeting this might be. And the angel said unto her: Have no fear, Mariam, for you have found favor with God, and behold, you will conceive in your womb and give birth to a son, and you shall call his name Yeshua. This one will be great, and will be called Son of the Most High, and the Lord God will give him the throne of his father David, and he shall reign over the house of Jacob forever, and there will be no end of his kingdom. Mariam said unto the angel, How shall this be, seeing I know not a man? And in response, the angel said to her: Holy spirit will come upon you and the power of the Most High will overshadow you; for that reason also what is born will be called holy, God’s Son. And behold, Elizabeth, your relative, even she has become pregnant a son in her old age; and this is for her who was called barren [the] sixth month, because with God no saying will be an impossibility. Now Mariam said, Behold the handmaid of the Lord, may it be done with me according to your pronunciation. And the angel departed from her. Mariam understood very well what kind of assignment she received from God and that it would not be an easy one. Rather, she must have realized that on the part of men - who were not well informed, which incidentally could not be - difficulties were to expected. Her premarital pregnancy would undoubtedly be misinterpreted and give her the disapproval of the people around her. But as Hanna [Elohim’s ‘âmâh], another nameless one, Mariam showed herself fully prepared to subject herself as God's slave to his counsel (1 Sam 1). For the members of Elohim's true Israel this is an encouragement to rely always entirely on Him and his Son, in the confidence that they are able to carry us beyond our human limitations. Very remarkable how Luke precisely locates John's ministry with regard to time! That provides us much certainty about the calendar dates regarding Yeshua's own service which started six months later, therefore, in autumn of the year 29 AD, and then took 3½ years, coming to an end with his sacrificial death on Nisan 14 of the year 33 AD. The King came indeed to his royal capital, but the city with its population - led by their religious leaders - had no regard for him nor for the things which had to do with peace and salvation. He was despised, and rejected by men; a man of suffering, and acquainted with disease: and as one from whom men hide their face he was despised; and we didn’t respect him. Surely he has borne our sickness, and carried our suffering; yet we considered him plagued, struck by God, and afflicted. But he was pierced for our transgressions, he was crushed for our iniquities; the punishment that brought our peace was on him; and by his wounds we are healed. All we like sheep have gone astray; everyone has turned to his own way; and Yahweh has laid on him the iniquity of us all. It pleased Yahweh to bruise him; he has put him to grief: when you shall make his soul an offering for sin, he shall see his seed, he shall prolong his days, and the pleasure of Yahweh shall prosper in his hand. ● the obedience of the nations (Gn 49:10; Ps 2:6-8; 45:6 ; Dn 7:13-14, 27). After he, who was a complete and perfect man, had brought the atoning sacrifice of his own life on earth, and then returned to the presence of his Father in heaven - because that One had raised him to be again a spiritual son – the apostle described him as the reflection of [his] glory and the exact representation of his [God's] very being (Hebrews 1:3). So, also after his resurrection and return to life in the heavens, the Son is still not God, but the exact imprint of his very being. For there is one God, also one Mediator of God and people, man Mashiach Yeshua, who gave himself as a corresponding ransom for the benefit of all, the testimony for specific ages. For the corresponding ransom, in the sacred Greek Scriptures the unique word αντιλυτρον is used, referring to the (also unique) form of mediation whereby the break with God - that was created by Adamitic sin - could be undone; yes, even completely could be restored! In view of God's standard of perfect justice, that breach could only be bridged by redemption. A ransom would have to be paid, a phenomenon about which we, in modern times, also hear a great deal about, but then often in connection with kidnappings and hostage taking. Release and preservation of life will then mostly occur if a certain amount of money is paid. However, since in Adam perfect human life with eternal outlook had been lost, humankind could only be set free from sin and its evil effects, if there could be provided a ransom of corresponding value: Perfect human life; no less, but also no more! Already in the Mosaic Law, that divine righteous principle was thus laid down Soul for soul, eye for eye, tooth for tooth, hand for hand, foot for foot (Ex 21:23, Dt 19:21). Those who trust in their wealth, and boast in the multitude of their riches— none of them can by any means redeem his brother, nor give God a ransom for him. For the redemption of their life is costly, no payment is ever enough, that he should live on forever, that he should not see corruption. And here it is also where the human Mashiach Yeshua comes into the picture as the only suitable Mediator between YHWH Elohim and man, he who gave himself as a corresponding ransom for the benefit of all. Since the ransom, in terms of value, was to be in balance with Adam in his perfect state, that requirement disproves the view that is celebrated in the vast majority of Christendom, namely that Yeshua on earth was both God and man. If Yeshua were really a god-man, the ransom would have far surpassed in value that which was to be redeemed: Perfect human life. At his creation, the first Adam became a living soul (Ge 2:7). Consequently, Yeshua, as the last Adam, poured out his soul into death in order to provide an equivalent ransom (Isa 53:12). Only after his resurrection he became a life-giving spirit (1Co 15:45). In principle, his ransom had so much power that all Adamites could be redeemed. In one single act, by offering himself to God as a sacrifice, the Son of God settled sin forever. That sacrifice was so effective that it did not have to be repeated from year to year, as was the case with the animal sacrifices within the requirements of the Thorah in Israel. The effect of it goes all the way back to all people who have lived since the foundation of the world. When God's Son on earth died vicariously for all Adamitic humankind, the judgment that rested upon her in Adam was in principle taken away from her. Indeed, in principle, because we also know in advance that not all the living will avail themselves in belief and in great gratitude of that divinely given provision. Though available to all, not all will receive life through it. In that knowledge Yeshua therefore said the following about himself: Just as the Son of Man did not come to be served, but to serve, and to give his soul as ransom [λυτρον and not αντιλυτρον] in exchange for many (Mat 20:28).